This article is about the English actress. For the author of children's fiction, see Rosemary Harris (writer). Rosemary Ann Harris (born 19 September 1927) is an English actress. She is a 1986 American Theatre Hall of Fame inductee. Harris began her stage career in 1948, before making her Broadway debut in 1952. For her New York stage work she is a four-time Drama Desk Award winner and nine-time Tony Award nominee, winning the Tony Award for Best Actress in a Play in 1966 for The Lion in Winter. On television, she won an Emmy Award for the 1974 TV serial Notorious Woman, and a Golden Globe for the 1978 miniseries Holocaust. For the 1994 film Tom & Viv, she received a Best Supporting Actress Academy Award nomination. She is the mother of actress Jennifer Ehle. Harris was born in Ashby-de-la-Zouch, Leicestershire, the daughter of Enid Maude Frances (née Campion) and Stafford Berkely Harris. One of her grandmothers, born into a family of boyars in Muntenia, was Romanian. Her father was in the Royal Air Force and as a result, Harris' family lived in India during her childhood. She attended convent schools, and later studied at the Royal Academy of Dramatic Art from 1951 to 1952. Early in her acting career, she gained experience in English repertory theatre. In 1948, she acted in Kiss and Tell at Eastbourne with Tilsa Page and John Clark and later with Anthony Cundell's company at Penzance, where she played the mother in Black Chiffon. She went from Penzance to train at RADA. She first appeared in New York in 1951 in Moss Hart's Climate of Eden, and then returned to Britain for her West End debut in The Seven Year Itch which ran for a year at the Aldwich. Harris at the Chichester Festival Theatre, 1962. "Olivier gloomily anticipated bad reviews. But RB Marriott, in The Stage, found O'Toole to be 'a magnificent Prince' and Rosemary Harris 'the most real and touching Ophelia'. (In contrast, Felix Barker, in the Evening News, called her 'an embarrassing deb who has had too much gin'.) And Harold Hobson, in The Sunday Times, was overcome." Her first film followed, Beau Brummel (1954) with Stewart Granger and Elizabeth Taylor, and then a touring season with the Old Vic brought her back to Broadway in Tyrone Guthrie's production of Troilus and Cressida. She met Ellis Rabb who had plans to start his own producing company on Broadway. By 1959, the Association of Producing Artist (APA) was established, and she and Rabb were married in December of that year. In 1962, she returned to Britain and Chichester Festival Theatre during its opening season when the director was Laurence Olivier; she appeared as Elena in Olivier's celebrated 1962-63 Chichester production of Uncle Vanya. In 1964, she was Ophelia to Peter O'Toole's Hamlet in the inaugural production of the Royal National Theatre of Great Britain. Returning to New York, she worked further with the APA, and then was cast as Eleanor of Aquitaine in The Lion in Winter, a performance that garnered her a Tony Award in 1966. Rabb directed her one last time as Natasha in War and Peace in 1967, the same year they agreed to divorce. A little while later, Harris married the American writer John Ehle. They settled in Winston-Salem, North Carolina where their daughter, Jennifer, was born in 1969. Jennifer Ehle followed in her mother's footsteps by becoming a noted film, television and Broadway actress. In 1974, Harris starred in the BBC TV serial Notorious Woman, which aired on PBS in the US as part of Masterpiece Theatre. For this role, she won the 1976 Emmy Award for Outstanding Lead Actress in a Limited Series. She won a Golden Globe Award for Best Actress - TV Drama for the 1978 NBC miniseries Holocaust, which also starred Meryl Streep. Reviewing the BBC's 1983 production of To the Lighthouse, an adaptation of Virginia Woolf's novel of the same name, The New York Times' John J. O'Connor wrote: "A luminous, flawless performance by Miss Harris makes Mrs. Ramsay as memorable on film as she is on the printed page." She received a Best Supporting Actress Oscar nomination for the 1994 film Tom & Viv. Harris and her daughter Ehle, played the young and elderly incarnations, respectively, of the same character in István Szabó's 1999 film Sunshine, about a Hungarian Jewish family. They had previously played the young and old Calypso in the 1992 Channel 4 adaptation of The Camomile Lawn by Mary Wesley. Harris appeared in the rotating cast of the Off-Broadway staged reading of Wit & Wisdom. In 2007, she received the North Carolina Award for fine arts. Her husband, John Ehle, won the same award in 1972 for literature. 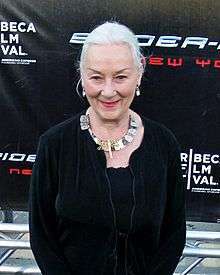 In 2002, she appeared as Aunt May Parker in the first film adaptation of Spider-Man, reprising the role in the sequels Spider-Man 2 (2004) and Spider-Man 3 (2007). 2001: Golden Satellite Award for Best Performance by an Actress in a Supporting Role, Drama - Sunshine (won) (shared with her daughter, Jennifer Ehle). ↑ Rosemary Harris Film Reference bio. Filmreference.com. Retrieved on 27 August 2011. ↑ Rosemary Harris biography at Yahoo! Movies. Movies.yahoo.com (19 September 1927). Retrieved on 27 August 2011. 1 2 Rosemary Harris and the Picture: Madonna of the Slaughtered Jews. Nmia.com. Retrieved on 27 August 2011. ↑ Hollywood made in Romania (partea a II-a). eroiiromanieichic.ro (8 December). Retrieved on 13 January 2013. ↑ "National Theatre actress: 'I wasn't a bit nervous'". BBC Online. 22 October 2013. Retrieved 9 June 2016. ↑ Ellis, Samantha (12 March 2003). "Hamlet, National Theatre, October 1963". The Guardian. London. Retrieved 9 June 2016. ↑ See the VHS recording of this performance issued by Arthur Cantor Films, New York. ↑ O'Connor, John J. (12 October 1984). "TV Weekend; Virginia Woolf's 'To the Lighthouse'". The New York Times. New York City. Retrieved 9 June 2016. ↑ North Carolina Award profile Archived 15 August 2008 at the Wayback Machine. Wikimedia Commons has media related to Rosemary Harris.